It was an extremely long and grueling day (as always!). We started out at 4:30am, only to have a flat tire on the truck within the first 15 minutes. After we finally got the spare tire changed, we were on our way. We picked up 3 other helpers on the way, as we drove first from Cusco to Ollantaytambo, then to the communities of Patacancha, Qalqanqa and Yanamayu. The roads, as you may well know, go high into the mountains and are dangerous switchbacks all the way. Our saving grace was that it is not rainy season, so we were able to pass without incident, although we still had to drive slowly and with much caution. We brought 18 BBOXX7 units, which consist of a 20 Watt Solar Panel, 7 amp hour Battery, Controller, 2 LED Lights, adapters for cellphone charging and radio, all necessary cables, sockets and switches. As the day progressed, we met with many different families in these communities that had been identified by the community Presidents. These families had shown interest in the solar lighting systems for their estancias, and were willing to contribute to the cost of the system. As the families are so spread out, we met with them in many different locations bringing the solar panel systems to them. In total, we made about 8 different stops. At each stop, we met with families, demonstrated the units and installation, and provided them with literature and contact information for follow-up trouble shooting. Buen Power Peru contributed funding for transportation and delivery costs. In total, there are 151 people that will now have access to electricity in their estancias. Through the 2013 Shapiro Foundation grant, solar electricity was installed in the school in Pacramayu. Students had come to the school from Pacramayu (about 50 families), Huarcayo (about 30 families) and Calcanca (about 30 families), but before the electricity project, all but five had left to attend school in nearby Lucre, a hike of at least two hours one way. Now the students, their teacher and an aide will return to their local school. The electricity project provided charging station for the 15 laptop computers that the Peruvian government had provided to the school. In addition, families in all three of the villages were provided with Dlight solar light kits so that they can light their homes in the evening and recharge cell pones and radios. Villagers' lives have been dramatically enhanced by the solar electricity and solar light project. Solar Lights for Three Villages in 2014! Good news! In November 2013, Path of the Heart received a grant from the Shapiro Foundation to install a solar panel for a school and community room in the remote Andean village of Pacramayu. 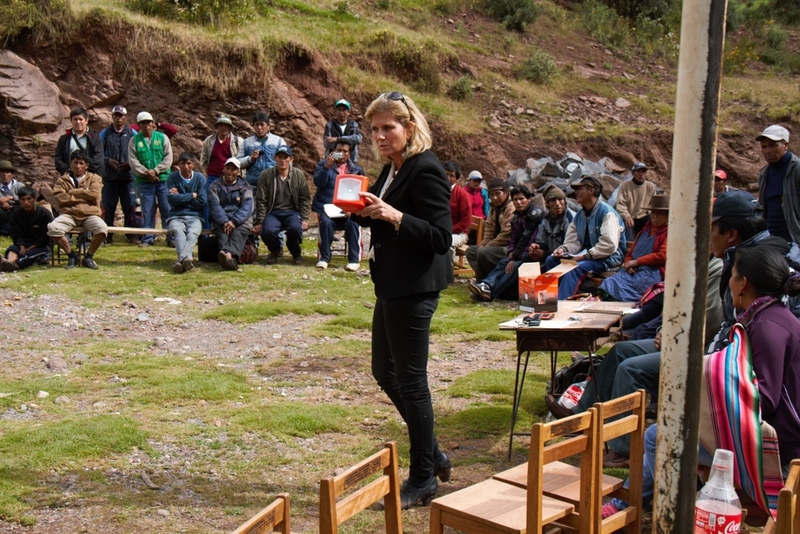 The addition of electricity will not only impact villagers in Pacramayu, but also families in the nearby villages of Huarcayo, and Calcana who send their children to Pacramayu for school. The panel will include power strips to charge laptops, radios, television, cell phones, and lights in the school. In addition, the families in these three villages will be provided with personal portable solar lanterns and cellphone chargers and adapters. With the personal lanterns, family duties can be carried out after dark and children can study. The cellphone chargers will enable families in these remote villages to maintain social and emergency contact outside of their village. Funding from the grant will provide light to the estimated 550 individuals living in these three villages. This Christmas 2013 Path of the Heart will bring hot chocolate, special bread and gifts to 3,000 children, and to their families in 20 native villages in the Valleys and upper Highlands of the Andes in Peru. Most of these villages do not currently have electricity. They also have only one school and teacher living in the village. Due to the difficult conditions of living at this high altitude there are limited chances for outside groups to visit the villages for the Chocolatada celebration. For over 11 years we have been bringing happiness and joy to the inhabits of the Sacred Valley region. Help us continue this all important mission of love. Visit the donation page to make a donation. 5 pound of Sinnamon and other spices. The villages proposed for this project are located at 9,000 to 14.000 feet altitude. Total number of children served by the project is approximately 3,000. The project will be done in 4 days in all 20 villages starting on the 21st of December. The cost for the project for each child is $1.20. We will document the completion of this project with reports, pictures and videos. Please help be a part of this celebration by making a donation to Path of the Heart. In the past weekend with the help of Path Of The Heart (www.pathoftheheart.com) and all of you, we have changed in hte most positive ways the lives of 10 families in the mountains of the Andes. This personal solar LED light provides better education and full opportunities to all who gets them. Our journey started at 3 a.m. in the morning ot the community of Charcahuaylla at 15,000 feet (approx.). It took us about 5 hours to hike to their location. We used horses to carry the lights. David, a 7 year old boy, and his father, Richard, were our guides to their community. When we arrived, the mothers and most of the children were taking care of their animials in the hills. Even the dogs were not there, but you could see them from far away. Because of the remoteness of these areas, it will never be possible to bring them regular electricity. This is why it is so important, with your help, to bring them the solar light. Thank you so much. Everyone in the communities shares their appreciation to you with their smiles. Every night when they turn on their solar lights, they think of you and hold a big space in their hearts for you. Have a blessed day. I would like to report that we have completed the installation of both solar panel systems in the communities of Chupani and Chuallacocca. Although the trek to get our materials and ourselves there was daunting, the end results were certainly worth it. In Chupani, we installed the panel on the roof of the school building. We used a special controller that would step down the 24V of the panel to 12V. We installed a very high quality 600W PowerBright inverter with the system. We hard wired ceiling lighting fixtures into 2 classrooms, 2 teacher bedrooms and the kitchen. We also included a power strip for other devices to be plugged in, and additional outlets in the bedrooms and kitchen. Because of the extremely long day (we started at the Cusco office at 4am, drove for about 4 hours, then hiked, with horses, for another 4 hours before we started the installation), we slept at the facility in the teacher rooms, and had dinner with them in the kitchen. The joy that we experienced was incredible. We were able to cook, eat and relax with light! The next day we hiked to Chuallacocca, and installed a similar system on the roof of their school building. We hard wired lighting into the school room and kitchen. Again, the teachers, children and families were thrilled with the installation. We returned last night about 11pm, after again hiking for about 2 hours and driving another 4 hours. I am happy to say that the installations went well, with everything functioning as they should. Thanks for this opportunity, and for all of your help.